Walter Elliot of Plymouth Longcase Mahogany Circa 1800 - Height 84in. This Longcase Mahogany Archive's Maker - Walter Elliot, Plymouth. Clock and watchmaker, St. Andrew's parish. Took out licence 15/2/1747-8 to marry Mary Bidlake of Totnes. Apprentices included Edward Dilke and Richard Heles. 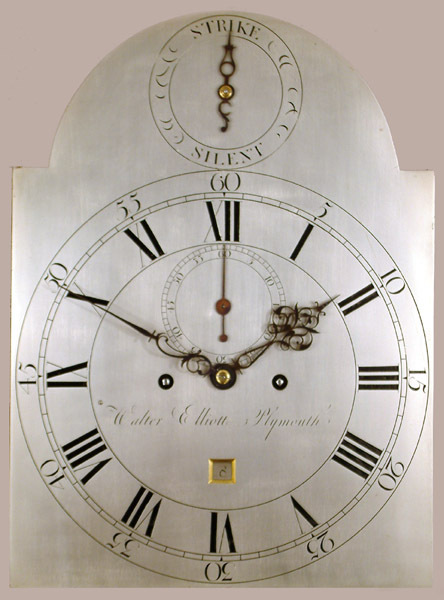 Brass arch dial longcase clocks with 5-pillar 8-day movement. Extracted from Devon Clocks & Clockmakers by Clive N. Ponsford. Superb mahogany case with breakarch top and brass moulding to inside edge of hood door and brass side frets. 12" breakarch silvered dial with seconds, date and strike silent in arch. Good quality 8 day 5 pillar movement with dead beat escapement. Brass bound weights. Hourly (rack) striking. Walter Elliot, Plymouth. Clock and watchmaker, St. Andrew's parish. Took out licence 15/2/1747-8 to marry Mary Bidlake of Totnes. Apprentices included Edward Dilke and Richard Heles. 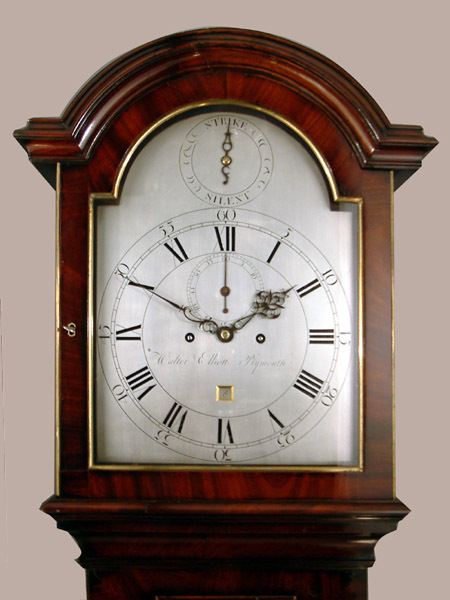 Brass arch dial longcase clocks with 5-pillar 8-day movement. Extracted from Devon Clocks & Clockmakers by Clive N. Ponsford.